Our Information Security Leadership Development Framework is built around a number of independent services which supports Security leaders, CIOs and other C-Level executives in delivering transformation programmes by ensuring adherence with Cyber Security Strategic Roadmaps, Target Operating Models, and Governance Frameworks across their teams and close stakeholders. > Transition Management Services: Supporting CIOs and other C-level executives throughout transformation programmes in ensuring adherence with Information Security Strategic Roadmaps, Target Operating Models and Governance Frameworks. > Trusted Advisor Services: Supporting senior management and Board level executives in the context of exceptional situations: Mergers and acquisitions, regulatory examinations, high profile incidents, special projects. > Coaching and Mentoring: Supporting Information Security Management teams at all levels in their communication with their counterparts & ensuring the right appreciation of all managerial, technical, cultural & political aspects. We can provide interim management services and interim CISO services when required as part of security transformation programmes, and assemble or manage specialist on-site transition teams to support specific security needs. Delivering complex transformation programmes in the Security space takes time and relentless drive. 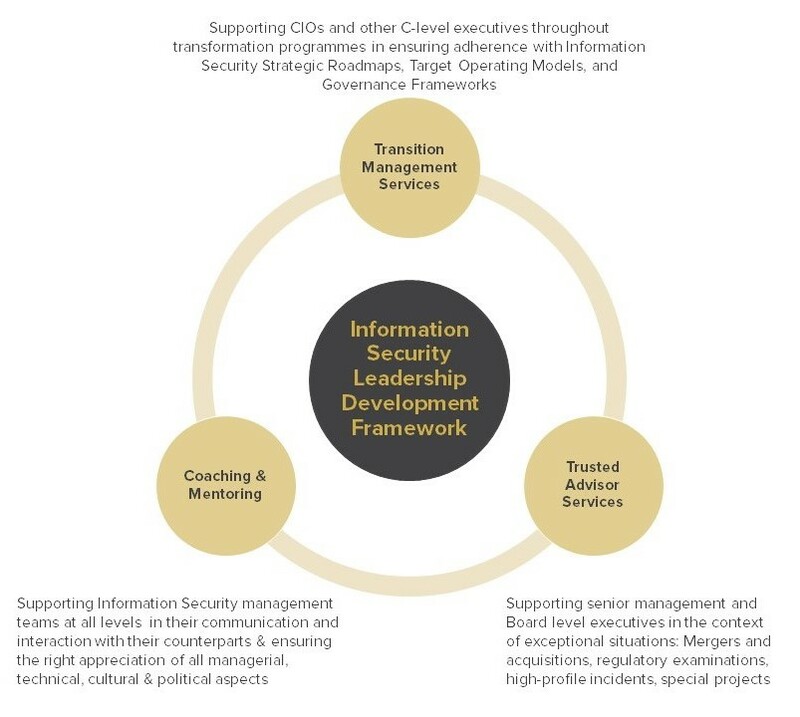 Key is the ability of the Security leaders, CIOs and other C-Level executives to combine strategic focus on mid to long-term objectives, with tactical acumen and political management of key stakeholders. These stakeholders are very often driven by short-term objectives and will have to be satisfied without compromising over longer-term transformation goals. In any large organisation, the Security leaders, CIOs and other C-Level executives must be surrounded by the right organisation, so that they can focus on managing upwards and sideways at their level, safe in the knowledge that management in the other directions (mostly downwards into their own organisation and sideways across lower stakeholders) is not being neglected, and that all managerial & technical aspects will be properly covered across their organisation. Information Security is also about people, culture and communication between stakeholders. We believe that Security is often a stepping stone in an individual’s career and managerial acumen is not always fully developed across many Security middle-management teams. We leverage over 20 years of experience gained across some of the largest UK and Continental Europe organisations to assist Security leaders, CIOs and other C-Level executives in developing their teams, supporting them at all levels in their communication and interaction with their counterparts & ensuring the right appreciation of all managerial, cultural & political aspects. Similarly, technical Security teams often need to evolve fast to match the evolution of cyber-threats, or sometimes, could be badly affected by staff turnover. We support technical Security teams at all levels in their communication and interaction with their counterparts & ensuring the right appreciation of all technical aspects.